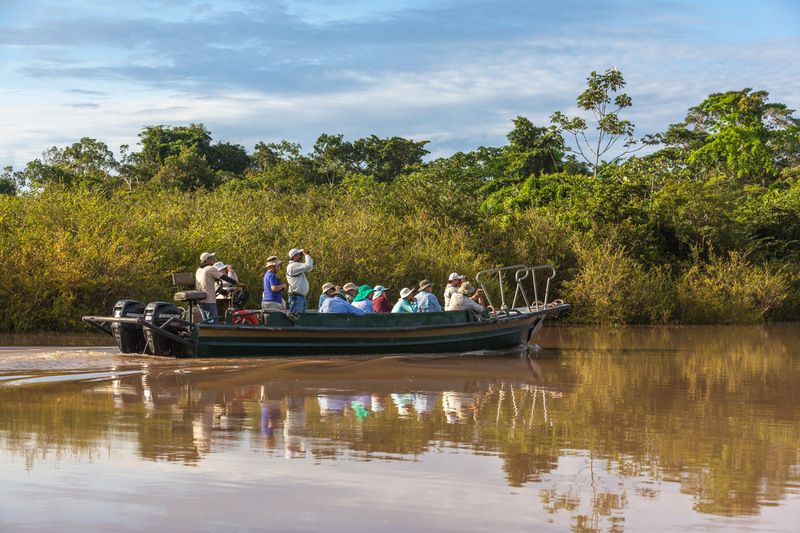 An Amazon River Cruise in Peru isn't your typical cruise. 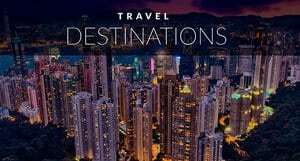 While many other cruises are all about creating entertainment and activities, an Amazon River Cruise is about experiencing life. Join us on the world's largest river and explore the culture, wildlife and beauty of the world's largest rainforest. Nothing needs to be created for you, the entertainment and enjoyment is right there before your eyes. 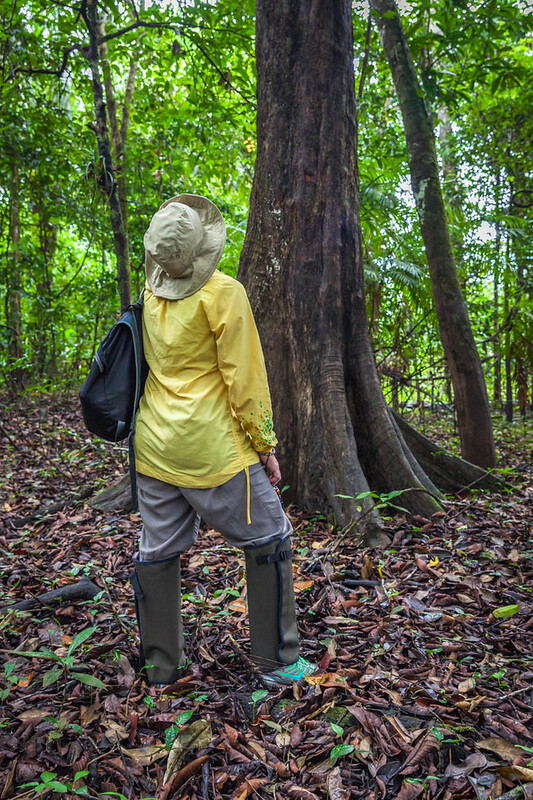 Days are filled with adventure on the Amazon. 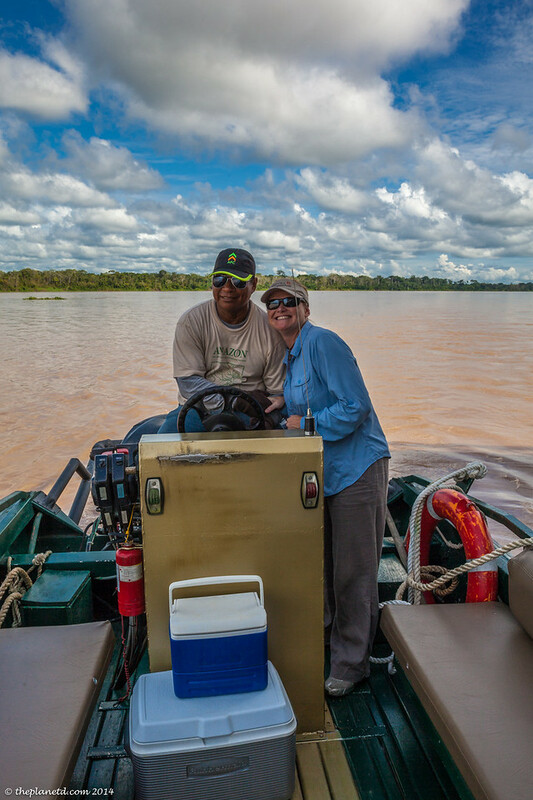 For those of you thinking of adding an Amazon expedition to your travel bucket list, we thought we'd give you an idea of what to expect each day on the river. For an Amazon River Cruise, you will fly from Lima, Peru to the town of Iquitos located in the middle of the Amazon Rainforest. This is the only city in the area and the only way in or out is by flight or boat. It's about as remote as it gets. 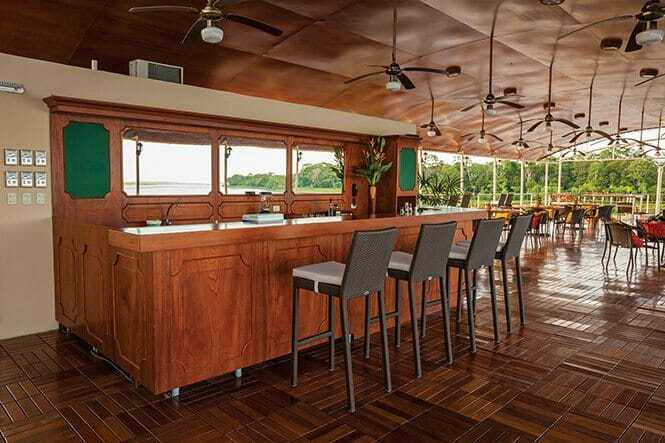 Once you land, you will take a shuttle directly to the river where you'll board the Estrella Amazonica and be given your welcome drinks on the upper deck. Before long you are heading out on the Amazon River to enjoy an amazing week of adventure. 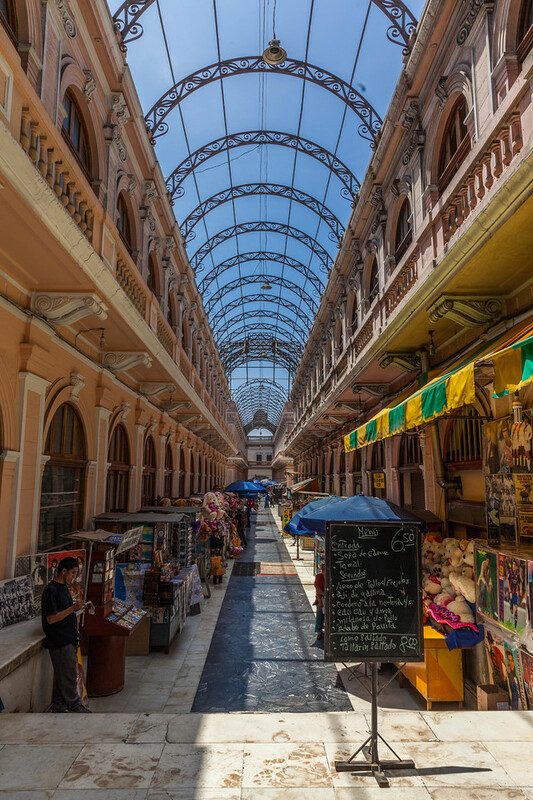 Explore Lima before setting out on your cruise. The cruise leaves at night so after you settle in, you can head down to the dining room for a delicious dinner followed by drinks on the deck. It's then the most peaceful rest as the riverboat rocks you to sleep. Each room has a balcony so you'll wake to an incredible sunrise as your bed faces out towards the river. You can close the curtains, but who would want to do that? I want to witness the mighty Amazon before my eyes. 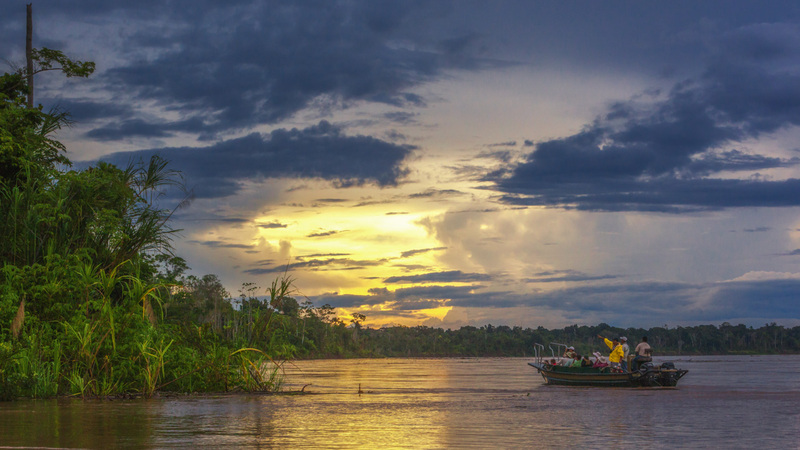 Exploring the Amazon on your Skiff Boat. 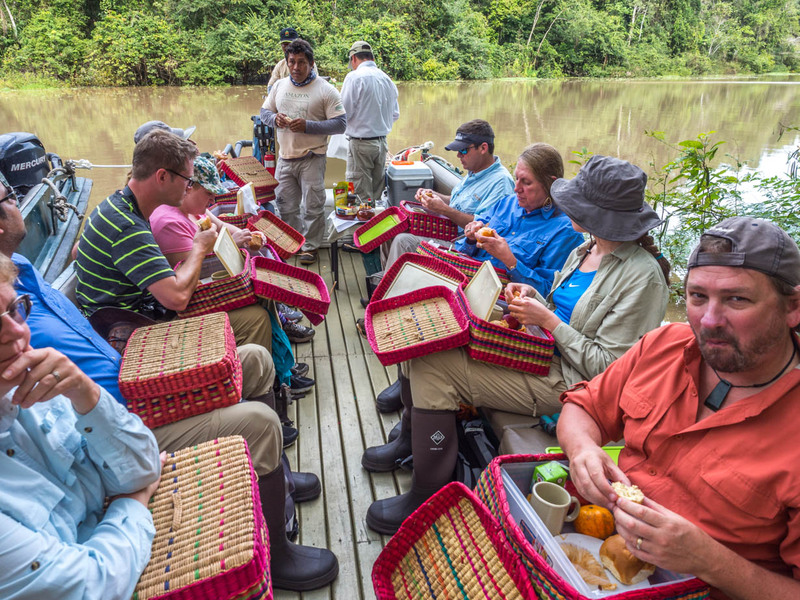 On an Amazon River Cruise with International Expeditions, you are not stuck on the riverboat for the week. You are actually off the boat more often than on. Your days will be spent going on safari and exploring the area. Safaris and excursions are taken by using skiff boats. Skiffs are amazing boats that are solid and can navigate easily through the fast-moving current of the Amazon River filled with logs and trees. The boats leave from the deck in the middle of the riverboat and passengers are divided into 2 groups. There are only 30 passengers maximum on the riverboat so each boat holds 15 people easily giving plenty of room for wildlife watching. There are at least 2 safaris a day in the morning and after lunch. But there are also sunset and night time safaris. So you are really exploring everything on the river that you possibly can. Each safari has an expert guide and captain, and often times there will be two guides on the boat searching for wildlife. Their eagle eyes are needed as it's difficult to spot the wildlife, but once someone sees it for you and points it out, you'll find that the jungle is filled with animals just waiting to be found. 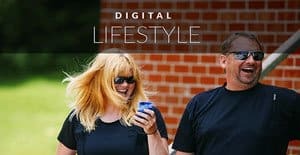 Each day is a bit different depending on the location and activities planned. Some mornings you will wake up and meet your guides at the skiff boats to go out immediately for a morning wildlife safari before breakfast. Sometimes breakfast will be served out on safari so you don't have to go back to the boat at all that morning. You can make the most of an entire morning on the river. Other mornings you will wake up for sunrise (if you wish) and join the guides on the deck for bird and wildlife watching as you enjoy snacks and fresh coffee. And on other occasions during your Amazon River Cruise, you will have the early morning hours free and start of with a hearty buffet breakfast in the dining lounge before going on a river safari until lunch. Each evening you will be told what the plan is and the itinerary for the day is written on a whiteboard so you will always be informed and in the know. Every safari is different. At times you are searching for monkeys and birds. At other times you are searching for pink dolphins. Most of the safaris take place on the boat and you never get off, but there are a few excursions where you go on dry land to explore. 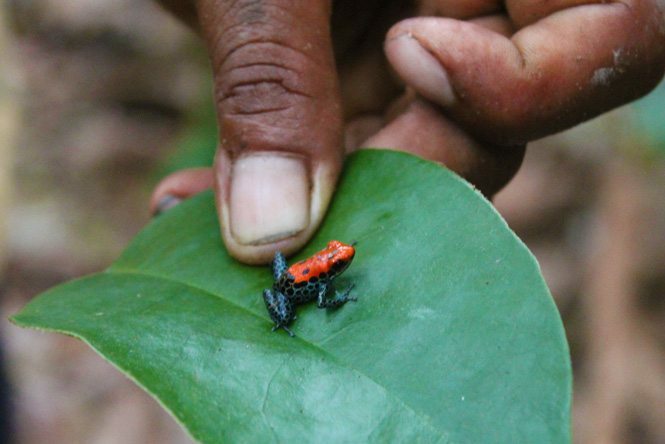 There are jungle walks to learn about the medicinal plants, and the flora and fauna of the area. There are village walks where you go into a remote village to meet the local people and learn about their way of life. 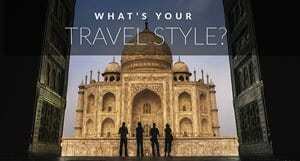 You can visit their homes, sit and listen to them explain their daily lives as your guide translates for you and you can even buy handmade jewellery. Dress appropriately for safaris and the boat. 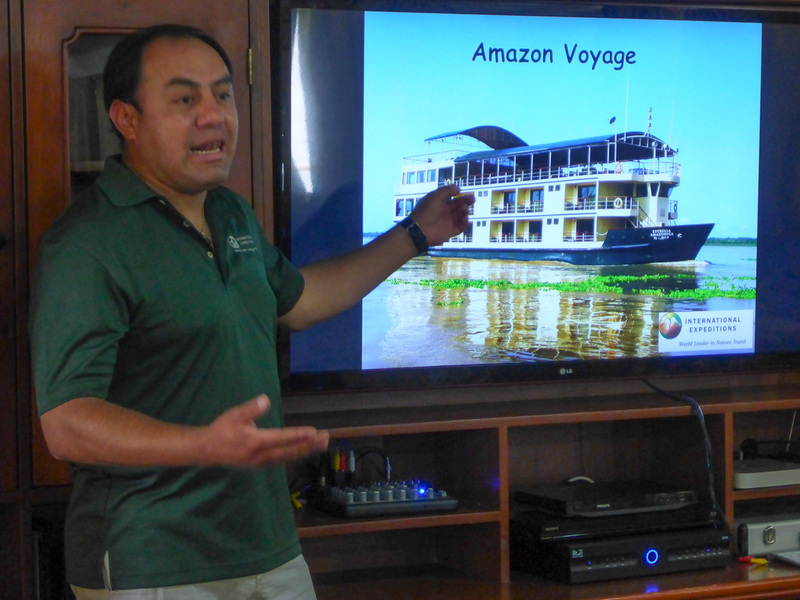 When going on an Amazon River Cruise, be sure to wear long breathable pants and shirts. We made the mistake of wearing shorts the first day and even with sunscreen we got burnt. Bring a hat, and stay covered. That sun is hot. You are very close to the equator and staying covered is important. Bring sunscreen and bug repellant as well. You are given water on the boat and you should take two water bottle with you each day, but there are coolers full of water as well should you drink it all. It's never too uncomfortable though because there is always a breeze on the river and the boats move quickly from place to place cooling you off as well. But sometimes it can't be helped when spotting wildlife that things are going to get hot. When you are moving slowly to see the most birds, monkeys and sloths that you can possibly see, it can become a bit stifling. But a nice surprise is every day is, just when you think you can't take the heat any longer, your guides pull out frozen towels for everyone to cool off. It's perfect timing. Note for Cameras: Don't forget extra batteries, and we highly recommend a zoom lens. 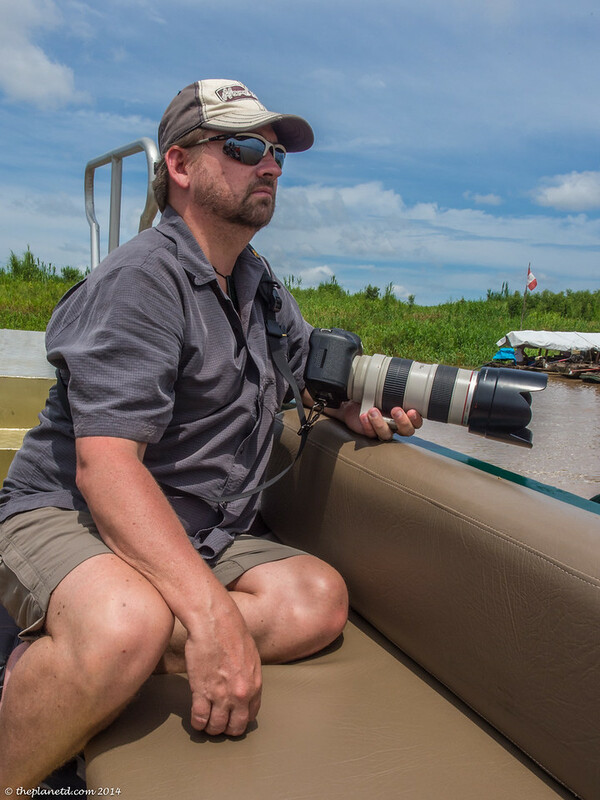 We had a 200mm lens, but we recommend a 100-400 for ultimate photographs in the Amazon. Often times wildlife is quite high in the air. Each skiff boat has a dry bag on board should it start raining, but why not take your own. That way you will know that your camera is safe and dry. 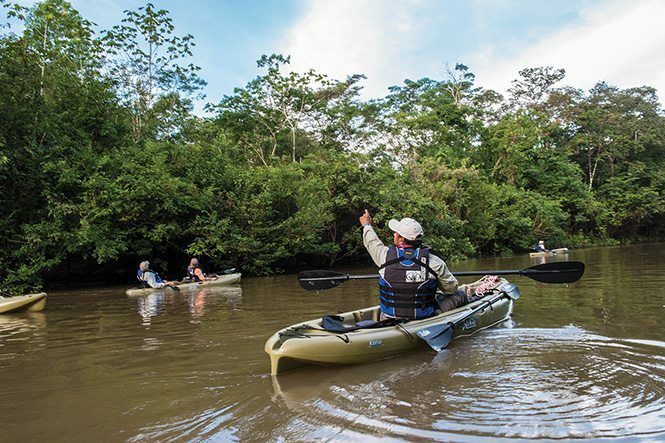 Kayaking – The Estrella Amazonica offers kayaking excursions on the Amazon River. It's included in your package at no extra cost. 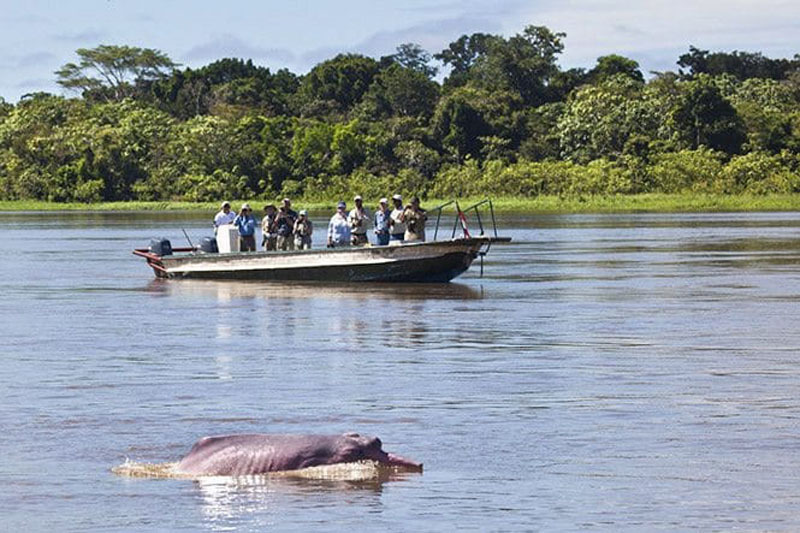 Swimming – If you want to have true bragging rights, go swimming in the Amazon River. How many people can say they did that? 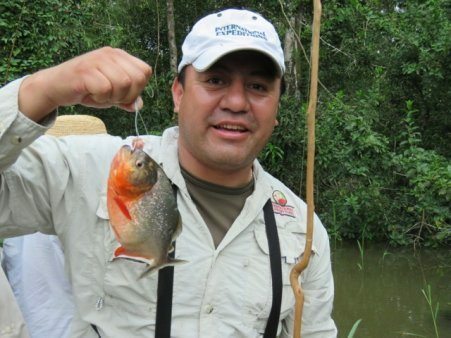 Fishing for Piranha – This is a once in a lifetime opportunity because how often will you ever see a piranha for real? 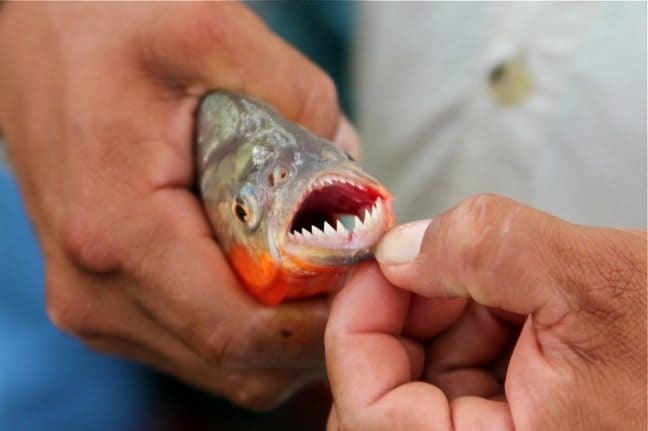 Dont' worry if you don't want to kill the poor misunderstood creatures, you can always let them go. On the boat or on the skiff lunch is awesome! After a morning on the river, you'll be exhausted. The sun is hot and the air is humid so it will be a welcome change to go back to the air conditioned boat to relax. A large buffet lunch is served in the dining room with fresh juice and fruit. If you are anything like us, you'll want a nap after lunch and this is siesta time. As we said the days are hot and a little nap is just what the doctor ordered to regroup and relax before the next excursions begin. Best wildlife viewing on the Amazon is at sunset. After a good rest it's time to go out and explore some more. Wildlife is active at sunset and it's at this time you'll have an excellent chance of spotting sloths, monkeys and pink dolphins. During late afternoons on the river, the locals are moving about a lot too so you'll see longtail and dugout canoes on the water too. And let's not forget the magnificent sunsets. The Amazon is a rainforest and rain occurs often. Many times storm clouds are forming overhead creating incredible skies. Once you are back on the boat, everyone meets in the air-conditioned lecture room to go through everything you did that day. 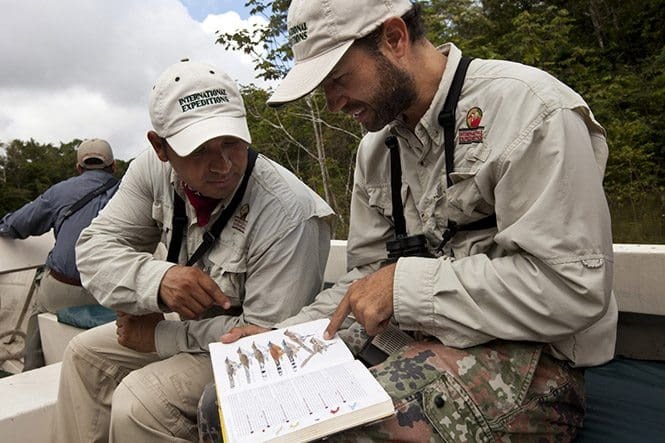 An International Expeditions Amazon river cruise gives everyone a checklist of the 1400 bird species that can be found in the Amazon and your guides will tell you everything you saw that day. Some people loved keeping a tally of the birds and wildlife. There's an audiovisual display showing where you are on the map and the guides are very informative with all the information you need to get the most out of what you saw. It is at this time that you will find out the plan for the next day as well. 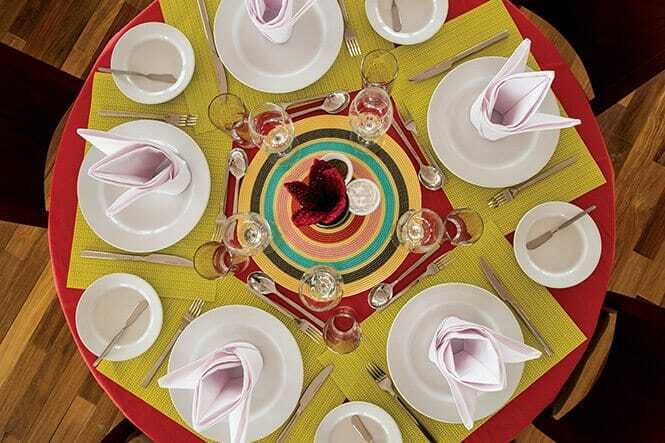 Dinner is welcomed after an eventful day and each night is filled with different local choices. You won't go hungry on this trip. Something we loved was going up on the largest deck in the Amazon after sunset to enjoy evening cocktails and to get to know our fellow passengers. Each night everyone is offered a free local cocktail, beer or wine as they relax and unwind. It's a great atmosphere, the evening temperatures have cooled off and once you've settled in, the entertainment begins. The guys on the ship, may be amazing chefs, guides, captains and stewards, but they are also talented musicians. 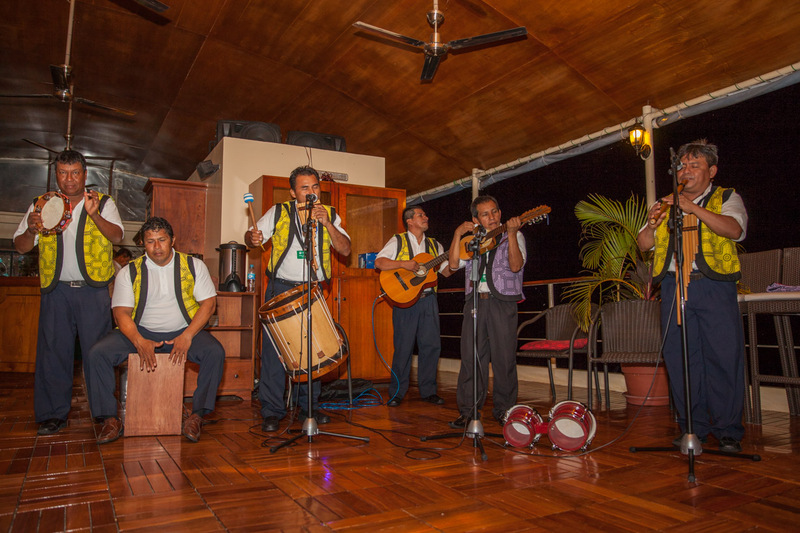 We loved listening to them play Peruvian music each night. They broke out the guitars, pan flutes, and drums and entertained for as long as we cheered. It's the perfect ending to a perfect day. If you've ever wondered what to do on an Amazon River Cruise, this should answer most of your questions. Days are full of excitement. But never fear, if you find that you are tired or not feeling up to going out on safari every time, you can stay on board and relax on deck watching the river in peace. You can read a book, and enjoy the view from the deck or your own private balcony. 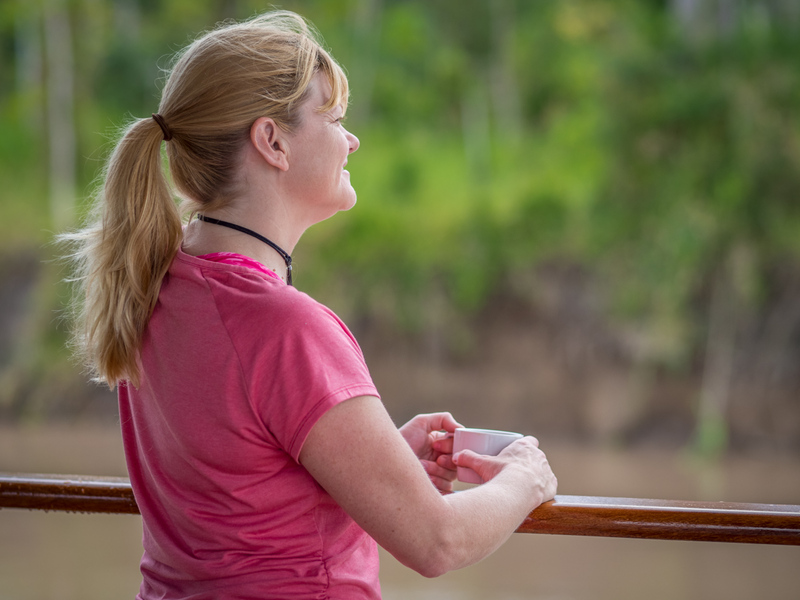 This is your Amazon cruise, there's never pressure to do anything you don't want to do, it's your vacation and this is one trip that you'll be raving about for years to come! 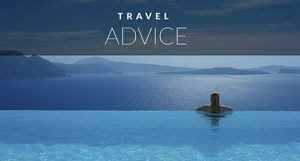 See our Peru Travel Guide for tips and ideas for travel there. 14 Responses to "What to Expect on an Amazon River Cruise – Life on the River"
When it does rain, we provide sturdy ponchos to ensure our guests stay extremely comfortable so they can focus on the astonishing Amazon jungle scenery. In celebration of our 10-year anniversary, we’re launching a new set of itineraries for our Amazon River luxury cruises on the Aria Amazon. 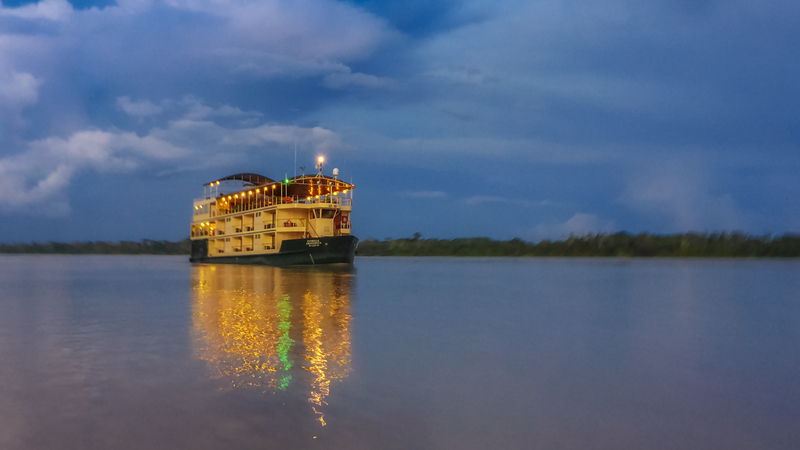 I did a lot of trips to the Amazon jungle and one of my favorites is rafting in the Tabopata River located in the border between Peru and Bolivia, but I never been in the north of Peru and I will definitely try this Amazon cruise. Nice article and great pictures!. This is definitely the way to go and yes! You must take your husband to the Amazon. It was funny, a lady on our ship was in the same situation, she had been before herself,Wow, beautiful photos, and it sounds super relaxing! I’ll certainly add it to my list! What an amazing trip and informative post! We are currently living in Brazil and considering an Amazon river tour. I went in 1997 while I was living abroad as an exchange student, and we traveled for a week on the Amazon. We spent nights in different Indian villages. Bathed in the river, and had some umm…interesting restroom experiences. It was amazing. I’m a little older now though and not for roughing it-and my husband Dale has never been. Reading your post made me realize I absolutely need to take him to the Amazon! Wow! That must have been amazing in 1997. It would have been so untouched then! I know what you mean though, as you get older, you want a little more luxury. This is definitely the way to go and yes! You must take your husband to the Amazon. It was funny, a lady on our ship was in the same situation, she had been before herself, but her husband had never been, so she was showing him the ropes.